Looking for wedding hairstyles for bridesmaids is a tricky business. The hair up look must be gorgeous, but not so gorgeous to upstage the bride. (As if!) And you can be sure each girl will have their own ideas! 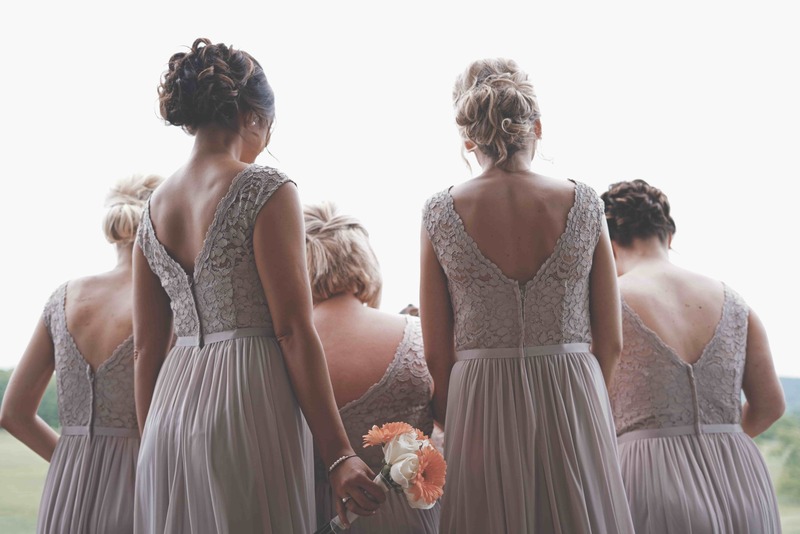 Whether you’re choosing styles for your gals or helping out (good work, bridesmaid), we’ve put together our favourite bridesmaid updos that all of Team Bride are going to love! Also known as a crown braid, this pretty style is suitable for almost all hair lengths and textures! No wonder it’s so popular! Start a French braid at the back of your head, then work along the hairline around the crown. Once the end meets the start, pin in place. Then keep those flyaways at bay with Frizz Ease Perfect Finish Polishing Serum. So on trend your wedding blog will practically write itself! Take a section of hair at the front and split into three pieces. Instead of plaiting the outside pieces inwards, pull the middle section out and over. Work your way to the back of your head and finish with a regular plait. Then keep those bad boys in place with a liberal spray of Frizz Ease Moisture Barrier Intense Hold Hairspray. Sure to be the coolest bridesmaid style of the year. Messy texture works a treat so spray damp hair with Beach Blonde Sea Salt Spray and rough blow-dry. As you plait, leave a bit out along the front and sides, then pull apart the braid for that slightly disheveled look. Feeling the whole braid vibe? There’s a lot more where that came from here. Sleek, elegant, and - as the name suggests - perfect for dancing! Apply Frizz Ease Forever Smooth Blow Dry Styling Spray to damp hair and blow-dry super straight. Put the hair in a ponytail and either twist into a bun or wrap hair around a hair doughnut. Pin into place and secure any loose hairs. For an immaculate finish spray with Frizz Ease 100% Shine Glossing Mist. Effortlessly beautiful, this is one of our top bridesmaid hairstyles for long hair. Leave a few face-framing strands at the front and fix with Frizz Ease Moisture Barrier Flexible Hold Hairspray for loose curls that’ll stay put all day. Often overlooked, but don’t underestimate the power of a low ponytail. The trick is to split the hair. Clip the top half out the way and tie the bottom half into a tight ponytail. Then taking the upper section, lightly tease and smooth over, then sweep it back to join the lower ponytail, creating one voluminous masterpiece. If your day has a vintage or rock theme, this style will work perfectly. You’ll need large-barrel curling tongs, clips, bobby pins, a smoothing comb and lots of Frizz Ease Moisture Barrier Intense Hold Hairspray. And don’t forget a slick of pillarbox red lipstick. More vintage glamour. The secret to a perfect 60s style beehive is to backcomb, backcomb, backcomb, then backcomb some more! The higher you go, the more drama you’ll create. This one’s a modern classic. Run Luxurious Volume Perfectly Full Mousse through damp hair and blow-dry. Curl the whole head, then pin away - but be sure to keep it loose and low. And the beauty is if a hair falls out of the place, no worries, it’s meant to be messy! How demure! Add texture with Beach Blonde Sea Waves Sea Salt Spray, then take your hair over to your chosen side and tie it into a ponytail. Thread the ponytail through a hair doughnut, then wrap the hair over the edges and pin into place. Tres chic, darling. Need a short bridesmaid hair style for your bob-loving friend/cousin/sister? This is so simple, she can even do it herself. Add body at the crown with Luxurious Volume Root Booster Blow Dry Lotion then roughly twist strands and pin into place. The messier the better! If one or two bridesmaids prefer their hair down, why not meet them halfway? A pretty top-knot? A halo braid? In fact, all the above styles can work in one way or another. If the girls can’t agree on one style, why not give them the same accessory to work with instead? A glitter bow, floral headband or bejewelled comb can ensure they match your theme, while letting them feel like themselves.